10” pneumatic wheels. Heavy duty gear box. 15Kg hopper. 25 kg hopper, jumbo 13 x 5 pneumatic turf tyres. Heavy duty gear box. The EV-N-SPRED FLEX-SELECT series are heavy-duty, highly manoeuvrable spreaders that are engineered to apply all types of material. Introducing an interchangeable tray system, one of three optional uniquely suited ‘trays’ can be selected, Low output for seed & granular chemicals, standard output for fertiliser, and high output for topdressing sand and de-icing salt applications. 25 kg hopper, jumbo 13 x 5 pneumatic turf tyres. Heavy duty gear box. Adjustable shut off system. 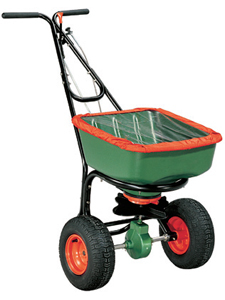 25 kg capacity, fibreglass shell with pneumatic tyres. Exclusive helical cone provides balanced spread pattern with uniform distribution of product. 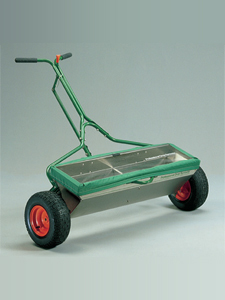 36” drop seeder, best suited for high precision applications. Powerful high pressure backpack sprayer. 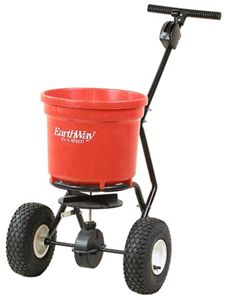 Its rugged construction and easy maintenance ensures a long reliable life. Ergonomically designed for comfort and to reduce back strain. Lance Extension -50 & 100 cm lengths. Flat fan & cone spray nozzles. The EvenSprey 250 battery powered sprayer has a rugged but light steel frame supported by three 8″ pneumatic tyres. It offers all weather access to the finest of turf surfaces without concern of damage. The battery powers the unit for up to two and a half hours between charges and the finger on/off control ensures that you only spray where you need to.